Scroll down to see our selection of Alternating Pressure and Low Air Loss products for sale. 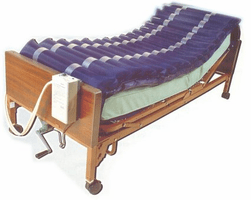 Alternating / Low Pressure Mattressesare systems designed to prevent and treat the effects of bed sores. We have a wide selection of different alternating pressure mattresses, low air loss mattresses and alternating pressure mattress pads and pumps systems. Alternating pressure and low air loss mattresses are systems intended for medical purposes that consist of a mattress with multiple air cells that can be filled and emptied in an alternating pattern. A pump connects to the alternating pressure or the low air loss mattress and regulates the cycles of inflation and deflation. Our alternating pressure and low air loss mattresses provide regular, frequent, and automatic changes in the distribution of body pressure to prevent and treat decubitus ulcers or bed sores. .